Mix shredded slaw, onions, cilantro and Jimmy's Cole Slaw Dressing together and allow to sit while preparing fish and tortillas. Mix together flour and taco seasoning. (Depending on how spicy you like your tacos, add more flour to mixture for milder flavor.) Cut fish in portions about 2 inches wide. Coat with flour and taco seasoning mixture. Add olive oil and butter to a pre-heated fry pan. Fry coated fish fillets in olive oil and butter until golden brown. Warm tortillas and add a portion of fried fish to each tortilla. 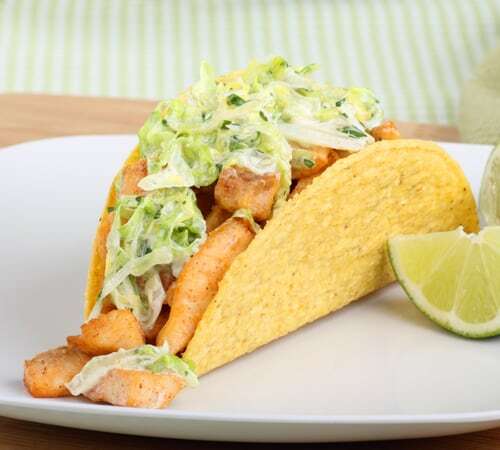 Top each taco with a squeeze of Jimmy's Tartar Sauce and then the Jimmy's cole slaw mixture and serve.